PORTLAND, Ore., June 22, 2017 /PRNewswire/ — Recapping the Forest Products Machinery & Equipment Exposition in Atlanta this past week, Plastic Machining Company (PMC) highlights solutions for components in machines & systems throughout all timber, lumber and wood product industries. PMC offers a myriad of part solutions for applications including primary and secondary breakdown and manufacturing; log and bulk processing; biomass and residuals processing; automation and optimization control; sort and stack; and planer mill, lumber, engineered wood, veneer and plywood manufacturing systems. Plastic Machining Company offers solutions for components in machines & systems throughout all timber, lumber and wood product industries. PMC custom OEM replacement parts have wide-spread use that cover the complete spectrum of components found in lumber presses, bandmills, carriages, debarkers, edgers, log turners, slabbers, driers, conveyors and other agricultural, forest and wood equipment, to name a few. Solutions for Timber, Lumber and Wood Product Applications: While new plastics technologies push the previous limits of load bearing, torque handling and gear drive capacity, machined and molded power transmission components made from high performance plastics offer long life, quieter transmission of power, self-lubrication, leading to savings and ease of maintenance, with advanced wear properties that simply can’t be matched by many other materials. On planer mill sorter lines, UHMW is extremely common in bin sorter machines. It makes a perfect wear material for wall liners, floor liners, wear strips and retaining belts. UHMW is used in bin kicker applications for its ability to act as a cushion that limits the impact of the board hitting the bin versus an undesirable rebound effect that occurs if the board is dropped directly into an unlined bin. Polyurethane is used for high strength and impact absorbing J hooks. Nylon is an alternative consideration for some wear applications. Nylon plastic is used for lifting slings and lumber sorting slings that provide gentle handling of “appearance-grade” (end-user) lumber in planer mill sorter applications. UHMW is used for tipple arms in sorting machines. Log carriages, “tong dogs” that hold unevenly shaped logs, turners and kickers all feature UHMW trucks for carriages that see loads exceeding 30,000 pounds. On positive feed lug charges, transfer chains ride along formed channels on UHMW wear liners, driven by metal or nylon plastic sprockets on a shaft. Nylon may also be used for shaft collars and roller chains. UHMW effectively replaces chain races and flights seen on the linebar, outfeed, rollcase, and return infeed transfer tables from smaller machines to full size industrial resaw machines, which cut timber along the grain to reduce large sections into smaller sections or veneers. In resaws, nylon plastic is used for chainbeds and chain guides, desirable for its self-lubricity. When wooden boards are trimmed and handled, an “unscramber” machine feeds a single layer of lumber to the outfeed chains of a trimmer line. Unscramblers achieve superior reliability and consistency through UHMW chain guides and chainways. The high abrasion and impact resistance of UHMW fights frictions and maintains a steady flow with extremely long part life. In many applications this means machines can be run at a higher speed operation. In stacking systems like a bell-crank lumber stacker, UHMW capped rooftop chains and roller chains minimize damage to both the lumber and the part. In unstacking and paneling systems, UHMW is utilized for fence linings and guides. 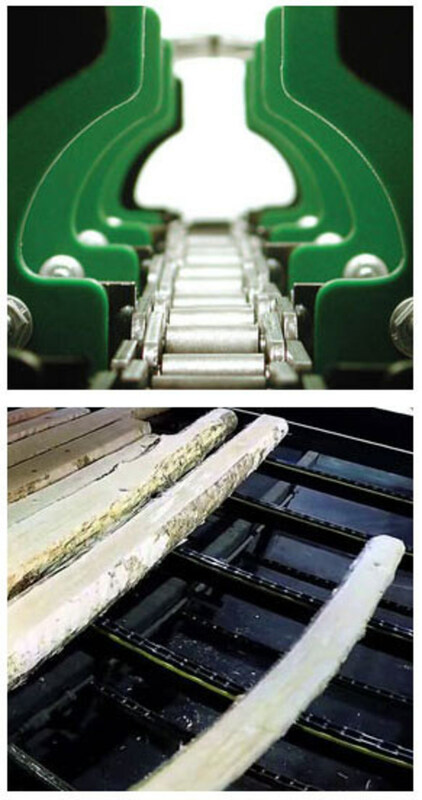 OEM and custom-designed machined parts from PMC work extremely well across all conveyor systems in lumber, wood and wood product industries, including vibrating, truss, gallery and belt conveyors, where plastic wear parts enable extended part life and damage-free transport. Plastic Machining Company (PMC) provides industry leading plastic machining, semi-finished sheet and rod, custom-designed and OEM parts, as well as plastic replacements for metal power transmission components. PMC plastic sheet, rod and parts are crafted from high-performance materials from Quadrant, Cast Nylons, Ensinger, Poly-Hi Solidur and other resin converters, manufactured with precision state-of-the-art CNC routers, mills and lathes. PMC parts scale from over twenty feet long and ten inches thick to parts that can rest on the tip of a finger. PMC can produce most custom parts within fifteen working days. Contact a PMC representative for specifics. Call 877-762-5449 or visit www.plasticmachiningcompany.com.